Farberware 13-Piece Knife Set Just $40.37! Down From $80! PLUS FREE Shipping! You are here: Home / Great Deals / Amazon Deals / Farberware 13-Piece Knife Set Just $40.37! Down From $80! PLUS FREE Shipping! 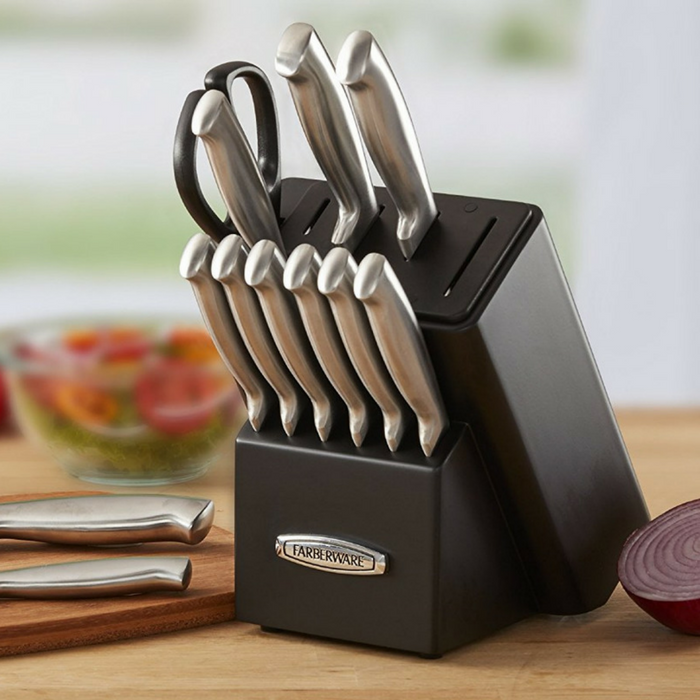 At Amazon, you can get this Farberware 13-Piece Knife Set for just $40.37 down from $79.99 PLUS FREE shipping! This Farberware Knife Block features EdgeKeeper Technology that automatically sharpens the straight edge knives with every use. Built-in ceramic sharpeners hone the blades whenever they are removed from the block and replaced, ensuring your knives are at peak sharpness every time you use them. Ceramic sharpeners are less abrasive than alternative materials and will gently sharpen knives resulting in a finer edge. This not only saves you time but is a safer, more efficient way to sharpen your knives. PROFESSIONAL SET: This 13-piece set includes an 8-inch chef knife, 8-inch slicer knife, 5-inch Santoku, 5.5-inch serrated utility knife, 3.5-inch paring knife, (6) 4.5-inch steak knife, a pair of all-purpose shears and a storage block. SELF SHARPENING: The EdgeKeeper protective sheath contains a built-in mechanism that hones the blade before and after each use, maintaining a blade’s razor-sharp edge. The built in self-sharpening technology guarantees a sharp blade for each use.